The breakdown of a marriage or civil partnership is always stressful in itself, and if there are financial issues to resolve it can make things even more difficult. At Jackson Quinn we can help you through this stressful time, and our specialist lawyers will advise you towards resolving all of the issues that arise. We offer FREE ½ hour initial advice appointments. Provided the child is the child of both the husband and wife, and that the husband, wife and child reside within England and Wales, the question of child maintenance is dealt with by the Child Maintenance Service. The parties may enter into a voluntary agreement regarding child maintenance and the Court may record this agreement in any subsequent court order dealing with other matters. However, the person who is entitled to Child Maintenance for a child in their care, can never be prevented from applying to the Child Maintenance Service for an assessment. The family team at Jackson Quinn can discuss child maintenance options with you in further depth and advise you of the best course of action to take. Married couples have a mutual duty to help support one another. Whether spousal maintenance is ordered from one party to another will often depend upon the disparity and level of their respective incomes. The Courts however, are now directed to create a ‘clean break’ upon divorce whenever possible, so there is no continuing liability for maintenance either way. Apportioning assets when parties are divorcing is never simple. In order for advice to be given on the appropriateness of any settlement, both parties need to provide full and frank financial disclosure. This involves providing details of income, assets, liabilities and occasionally outgoings, together with documentary evidence in support. This information is then exchanged with the other party in the hope that an agreement can be reached. If parties can not reach an agreement, it is likely that an application will be made to the court for the court to make a decision. The Court is directed to take into account a lot of factors which may suggest an unequal division of assets is appropriate. Even if an agreement is reached without the need to make an application to the Court, it is still important that any agreement is legally formalised. If not, there is a risk of financial claims being brought by either party at some later date, even after a divorce is finalised. 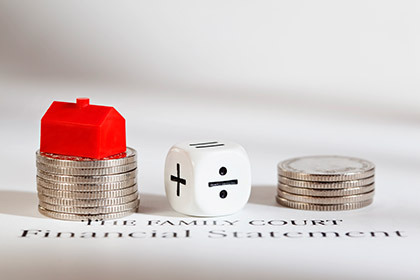 Here at Jackson Quinn, we have a wealth of experience in dealing with financial matters on divorce, no matter size of assets are involved. Our family team offers practical, professional advice, ensuring that our clients’ financial interest in any settlement is maximised.